With the subsequent public outcry and media storm across Canada, we’ve witnessed how important this issue is to people. 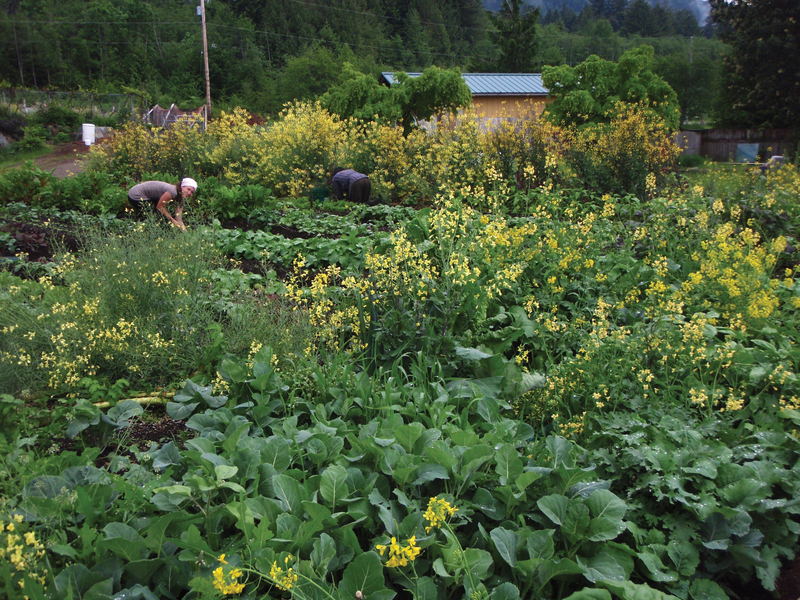 Cities across North America have changed their bylaws to support “urban agriculture” as a legitimate homebased business, including such urban centres as Victoria and Vancouver, BC. We have 2.5 acres in total, as do several of our neighbours. Three doors down our road are both cows and horses. As you can see from our photographs, the area we live in can hardly be considered “urban”. However, we are using the term to describe our situation as our property is zoned “residential” and we are doing small scale, organic growing of fruits and vegetables on one acre. Lantzville is a small community (population 3,500) just north of Nanaimo on Vancouver Island. Even the name, Lantzville, evokes images of small town comraderie, walking down main street, basket in hand, to see the butcher, the baker, the candlestick maker. It’s surprising that on such a quiet, rural, two-block long, dead-end road, with forest across the street and acreages on either side of us, that we would end up being ordered to stop such an essential activity as growing food for others because of a particular bylaw. The traffic on our dead end road (there are only four houses past us) has increased significantly as people make no bones about slowly driving back and forth to see what all the controversy is about. Of course, from mid-November to mid-February there isn’t much to look at except soil. The photos presented here cover what our property looks like from March through October as well as before and after photos. Here’s a brief background of our property, to lend some context to our current activities: The previous owner used an excavator and dump truck to mine and scrape the land bare. He had a soil screener set up on the property, selling the soil, then sand, then gravel, which resulted in lowering the level of the property by about four feet. When Dirk assumed ownership, all that remained was gravel. There were no worms, no grasshoppers, no birds, no butterflies; essentially – no living creatures! Since 1999, Dirk has made a tremendous effort to heal the land, beginning slowly – one wheelbarrow at a time. Nicole joined him in 2006. 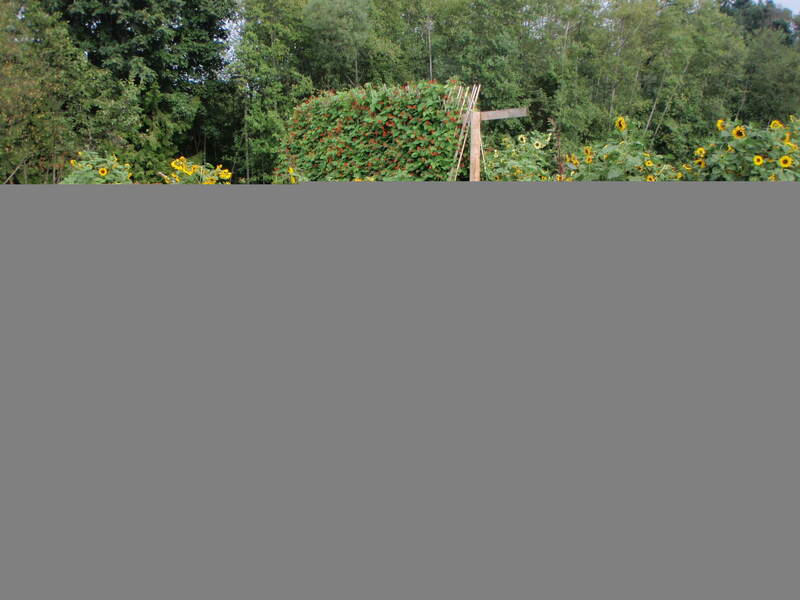 It has been a gradual, organic process from planting a few fruit trees and having a small growing area, to expanding with more hand-made soil using wood chips from local tree companies and a small amount of horse manure from local, Lantzville stables. Now we have four kinds of bees, several types of dragonflies, numerous types of butterflies, frogs, toads, snakes, hundreds of birds and much more! We have dedicated our time to supporting hundreds of community members who have sought guidance on how to become more sustainable in their own lives; from educating people on how to support sustainable local initiatives (including 4H and homeschoolers), to teaching families how to grow their own food. Three years ago, we also spearheaded Nanaimo’s most successful farmers’ market, The Bowen Road Farmers’ Market at Beban Park. 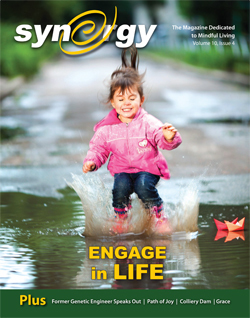 Not to mention volunteering our time to publish this magazine. Our goal is to have bylaws updated to reflect the current awareness and future needs of our communities. Yes, we could apply for rezoning, however this would only help “us” not the many people who are urban farming or SPIN farming (Small Plot INtensive – where landless farmers use people’s city backyards to grow food for sale). This issue impacts all of us on Vancouver Island. Many of you are aware that only 5% of our food supply is grown on Vancouver Island, thus 95% is imported. 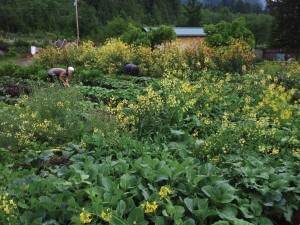 It may shock you to know that there is only two days fresh food supply on Vancouver Island. That means, any disruption in ferry service, trucking or problems at the US border (75% of BC’s food comes from California) would have a dramatic and immediate effect on our food supply. To us, “urban farming” is much more than a growing “trend” throughout North America – it is the way of the future; and the future is now. Each year land prices increase, preventing new farmers – especially younger ones – from acquiring land. Remaining farmable land (even including the Agricultural Land Reserve) is forever swallowed up by development, further reducing our ability to sustain ourselves and increasing our already extreme dependence on imported food. In light of this, we strongly believe it is our responsibility as individuals and as a community to stop and reverse this trend of complete unsustainability and at least work towards a model of self-reliance. That together, we see this as an opportunity to “change the system”. From day one, we did not want the focus to be “us”. Keep in mind what the bylaw means is that all ”urban farming” and SPIN farming is illegal! This includes: honey, vegetables, meat, eggs, plants, flowers, fruit, nuts – you name it! Of course, this affects urban and SPIN farmers at the Bowen Road Farmers’ Market as well as at other farmers’ markets in Canada where municipal bylaws have not been updated to reflect support for sustainable, local food production. Articles in the media have been hit and miss as far as accurate information goes, with some columnists even expressing opinions without knowing a thing about the issue, so it made sense for us to list the events as they have taken place over the past few months. Sept. 24th – We received a letter by courier from the RDN, letting us know that they had received complaints about the condition of our property. (to read this and the subsequent letter, click here and scroll to bottom)They cited Lantzville’s “Unsightly Premises” bylaw stating that their recent inspection “confirmed piles of manure and soil all over the property as well as on the District of Lantzville right of way.” They stated that we were to remove “the piles of soil and manure from the property and boulevard within fourteen (14) days,” and if we did not comply that Regional District staff could “remove the items at [our] expense”. We couldn’t help but notice the irony in that the letter was dated September 23rd, the same day that 8,000 compost bins were distributed to households in our region! Sept. 29th – We met with the RDN Bylaw Enforcement Officer, Brian Brack. Paul Manly, an independent filmmaker who has been following us for the past year, came along but was not allowed to film the meeting. During the meeting, we agreed to move the one pile of soil that was closest to the road and Mr. Brack gave us an extension to the end of October. Later that day, Mr. Brack and his manager arrived at our house, drove into the backyard while we were working and asked if we were going to move the pile. Dirk said he had planned on getting on it later in the day. After weeding for a few hours, we borrowed a trailer and worked until dark moving the pile. We had moved over half the pile before returning the trailer. The next morning, Mr. Brack and his manager showed up again. I was feeling irritated as he asked again if we were going to move the pile. I told him we worked until dark moving the soil and were planning to finish it soon. Dirk then came to the door and reiterated the same. We finished moving the pile that day. So… We moved the pile within 48 hours of our meeting with Mr. Brack. In that 48 hours, Mr. Brack and his manager showed up at the house twice, once per day, both times asking if we were going to move the pile, even though their letter gave us 14 days (until Oct. 7th) and Mr. Brack had given us a verbal extension until the end of October. Oct. 25th – Mr. Brack arrived at our place again (for at least the fourth time that we are aware of) and informed us that he’d been instructed to enforce our zoning and would be sending us a letter to that effect. Nov. 4th – We received the second letter by courier, dated Nov. 2nd stating that we have “90 days to cease all agricultural activity”. We immediately emailed Mr. Brack to ask him for a copy of the bylaw as it wasn’t available online and we wanted to understand exactly what the infraction(s) was. (We were told by City Hall that we could either read the bylaw in the City Hall office or purchase a copy for $35.00). We also asked Mr. Brack who he would recommend our friends and neighbours should direct questions to because we would be sharing this information with people. His response was, “I would suggest your friends channel their questions through you and you can liase with me by phone or by email or make an appointment to see me in person.” We emailed back saying, “their questions would be of a more general nature, about the bylaw, urban renewal, sustainability and urban farming. While we appreciate that you are a Bylaw Enforcement Officer and your job is to ‘enforce bylaws’, we hope that you appreciate that this issue transcends the nuances of our particular case. Out of common courtesy and professionalism, we are asking who you suggest that our friends should contact about the issues beyond yourself and Twyla.” (Twyla Graff is the Lantzville Administrator). …We did not receive a reply. Nov. 9th – We sent an email to Lantzville’s mayor and council giving them the background of the property (shared above) including before and after photos, sharing web links to urban farming sites including Victoria’s bylaw change, letting them know Vancouver Island only grows 5% of the food we consume here, the importance of supporting local agriculture and giving them the heads up that they may receive questions from Lantzville residents about the current residential zoning bylaw. Two councillors replied, thanking us for the email. The Mayor did not respond. Nov. 14th (we allowed five days to pass) – We then sent a detailed email to friends and neighbours in Lantzville only, attaching the letters we had received from the RDN, so they would understand that this meant all “urban farming” and SPIN farming is illegal. We stated our intention was that we do not want to be the focus, that our goal is to change the bylaws so that everyone in our region and across Canada who wants to grow food for sale, can do so. As we still had not received a reply from Mr. Brack, we listed the contact information for those who made sense to us: our Mayor and Council, the RDN Board members as well as Mr. Brack, Twyla Graff and Chris Midgely, the sustainability director, to bring them into the loop. Within two hours of sending this personal email out, the Mayor of Lantzville, Colin Haime, got hold of it and reacted by sending us an email, criticizing and lecturing us as well as letting us know that he had only received one email so far from a community member. (Umm… since our email had only been sent two hours prior… that would make sense, no?). For the next few days, a strange email exchange ensued with us doing our best to address his “concerns” and what seemed to be him avoiding our own points and concerns. He repetitively used phrases such as “I’m merely stating…”, “Just a suggestion…”, “Just my opinion…” followed by what sounded and felt to be biased opinions. He wrote that he was within his mandate, working on behalf of all 3600 residents, while the vociferousness of the exchange strongly suggested otherwise. He “merely stated” that we were “using children as emotional pawns”; criticized the subject line of our email to friends and neighbours which read “Dirk and Nicole have been ordered to stop farming”; asked “Why is current agricultural land in Lantzville inadequate for farming?”; let us know that emails to “RDN directors will carry no weight in achieving changes to bylaws in Lantzville”; and insisted he was within his mandate by telling us the “RDN directors have no ability or desire to allow Dirk and Nicole to farm.” We mentioned that we saw him visit the neighbour’s and suggested while he was right here it would have been a good opportunity for him to stop in to see what we are doing (Nicole recognized his vehicle as having already been to the one neighbour’s house three to four times). He didn’t respond to that point, or to a number of direct questions we asked. To us, it was essentially a one-way communciation, so after five emails we finally asked him to refrain from emailing us until he could do so in an unbiased, open and professional manner. A local couple obtained a copy of Lantzville’s bylaw 60 and as it is written, residentially zoned properties cannot “grow crops”. It doesn’t address selling, just growing crops. Vegetable gardens are crops, so as the bylaw now reads, in essence, people on residentially zoned property cannot grow food. Nov 19 – The media called! At that point in time, we also sent a detailed email to community members in the broader Nanaimo area. Over the next few days, several articles were published in Nanaimo newspapers, some of which, particularly Derek Spalding’s articles, went across Canada, the U.S. and were even published in the India Times. Once the media became involved, the mayor suddenly changed his tune and sounded open and collaborative. Nov. 21st – The media called and asked us to respond to them being told that we were being given an extension by the District of Lantzville – that was the first we’d heard of it. Nov. 22nd – Brian Brack emailed to ask us to meet with him and Twyla Graff. This was the first time we had heard from him since we asked him who the community should contact about the bylaw on Nov. 4th, 18 days earlier. Nov. 25th – We met with Brian Brack and Twyla Graff. Before getting to his point, Mr. Brack complained about the amount of emails and phonecalls they were receiving. He also warned us that we were “at risk of alienating the RDN”. Dirk stopped him to remind him that all Mr. Brack did was send a letter ordering us to stop farming and our lives were “turned upside down”. Whereas Mr. Brack and Ms. Graff were getting paid to deal with community concerns. After sharing our dissapointment concerning the manner in which we had been treated by the Mayor, lost sleep, lost crops due to being overwhelmed by this issue, we moved on to what they wanted to cover in the meeting. They verbally gave us an extension of 90 days to farm (for a total of 180 days from Nov. 22nd). They said then we could apply for a “Temporary Use Permit” (T.U.P.) which could give us up to three years, giving staff time to arrange public consultation meetings. They asked that we and supporters not attend the December council meeting as council had already heard our message loud and clear. So, where we are at now is essentially a waiting game. What they told us in that meeting is they will begin a public consultation process by the end of January. They asked us to give them time to get their ducks in a row, as it were. Therefore, understandably, we and our supporters are waiting with bated breath, poised and hoping for the best. We have received hundreds of emails and phone calls in support (and for the span of a few weeks we each received 200 emails per day!). Many of the letters sent to council, media and us said things like, “Eyes across Canada are watching you Lantzville,” “This is an opportunity for you to lead by example.” And this is indeed how we see it – an opportunity. In summary, it is very important how we as a community, as a society and as a culture frame this issue. This is not simply an issue of a bylaw. This issue is a matter of sustainability in general, food sustainability, food security and basic human rights. Furthermore, this issue also addresses and delves into our societal values. It begs the question, at this point in time, with what we now know, what do we value more: unbridled development (further destroying farmland, our food system and our ability to feed ourselves by building yet more golf courses and shopping malls on farmland) or do we value our health, that of our children’s and the health of our environment – our earth which we depend on for our health and our survival. The future is for us to decide. Let us decide now. We feel strongly that it is our responsibility as citizens to decide the future of our communities. This requires us to stand up and take the lead by making our voices heard. This then will force our “leaders” to follow us. They are our elected and paid “employees”. We, the taxpayer, are the “boss”. When there are bylaws and laws that do not serve us, and are even unjust, it befalls and behooves us to make sure those laws are changed for the good of all. Below, you will find some current examples of what we speak of. We encourage you to make yourselves more aware of what your rights are as a citizen before they are taken away without you even knowing. It is much easier to retain your rights than it is to get them back once you’ve lost them. We look forward to your letters and feedback on this issue. Dirk and Nicole are local food advocates, farmers, founders and board members of the Bowen Road Farmers’ Market, volunteer publishers of this magazine as well as active community members. 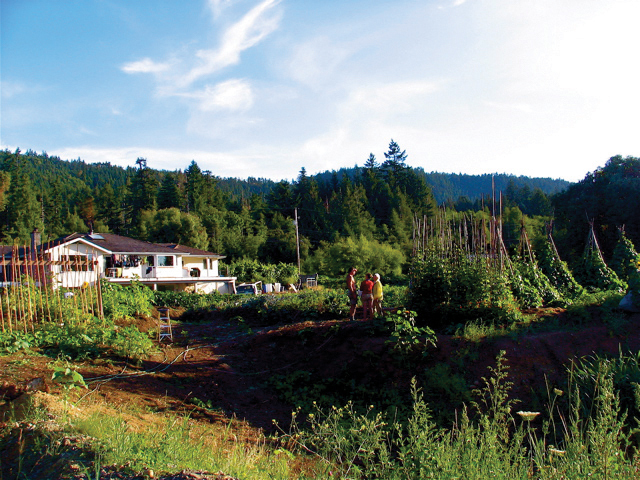 Well-known urban farmer and local food production advocate Dirk Becker has been ordered to shut down his 2.5-acre Lantzville farm because of a home business bylaw that does not include agriculture in its regulations. A local farmer hobbyist in DeKalb County, Georgia, who sells or gives away the various organic vegetables he grows for fun on his land, as he has for 15 years, is now being sued by the government. This entry was posted on Monday, January 17th, 2011 at 5:29 am	and is filed under FEATURE. You can follow any responses to this entry through the RSS 2.0 feed. You can leave a response, or trackback from your own site.